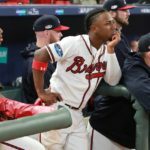 Braves’ Surprise Season Ends with 6-2 Loss to Dodgers Reviewed by Webmaster on October 11, 2018 . After staving off elimination in game 3, the Atlanta Braves hoped to even the series back to Los Angeles. Through the first five innings, things were close. The Dodgers had the first run in the first inning with a Manny Machado RBI. However, Mike Foltynewicz struck out five batters in four innings pitched to keep Los Angeles in check early in the game. In the fourth inning, the Braves took a 2-1 lead in the fourth with a Kurt Suzuki hit with Tyler Flowers and Johan Carmago scoring the runs. Unfortunately, that would be the last time the Braves scored. In the sixth, 2011 World Series MVP, David Freese would come through in the clutch with a single that allowed Puig and Bellinger to go in for runs for a 3-2 lead. In the seventh, the Dodgers would seal the Braves’ fate with a three-run home run from Machado with the Dodgers extending the lead to 6-2. The Dodgers would win the series 3-1 and will be going to the National League Championship Series for the third straight year. They will visit the Milwaukee Brewers on Friday, October 12. Even though the Braves got eliminated, they should feel proud. This team was expected to be one of the worst teams in the MLB before the season started. They surpassed expectations by going 90-72 with their first NL East title since 2013. The Braves have a bright future with the young team featuring Ronald Acuña Jr., who is expecting to win NL Rookie of the Year after recording twenty-six home runs for the season. The Braves also need to watch out for the Phillies who are also an up and coming young team. The Braves hope that this season was not a fluke and become a regular participant in the postseason. Next article Blog Should the NHL Come Back to Atlanta?